Well, it’s official. Wednesday’s summer solstice marked the first real day of summer and what better way to celebrate than with some awesome new releases from our labels? We’ve got something for every summer mood this week, whether you want to kick back and relax or blow off some steam. It’s time to whip out your popsicles and fruity drinks because this week’s highlights bring the heat. 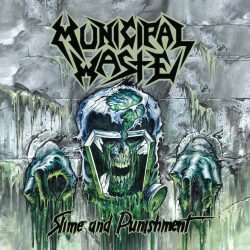 Municipal Waste is back with a vengeance for the first time in 5 year’s with their latest release, Slime and Punishment. Brought to you by Nuclear Blast, the thrash metal masters once again demonstrate their speed punk power, and with 14 songs in less than 30 minutes, you won’t know what hit you. You may get a bit of whiplash as they jump between insane riffs and surprise breakdowns with their signature tightness. Even though they’re out to punish with a bigger, bolder sound, the party animals stay true to self, old school and punny as ever. Slime and Punishment proves that Municipal Waste is a force to be reckoned with. Get a taste of the slime with the 360 visualizer below before getting the full album here. The fact that Jessica Hernandez & The Deltas are releasing a new album is exciting news in and of itself, but they up the ante by doing it twice–in two languages. Brought to you through Instant Records, Telephone / Telefono is the Goth pop/Latin punk-rock group’s first full-length bilingual release, recorded in both English and Spanish. Hernandez celebrates the duality of her identity as a first generation American born to a Cuban father and Mexican mother, and she made sure each Spanish song kept the same poetic power as the English version. The colorful energy of The Deltas perfectly complements Hernandez’s powerful vocals to create the Detroit-based group’s one-of-a-kind sound. All in all, Telephone / Telefono is a really fun listen, no matter the language. Watch the music video for “Run Too Far” below and compare it to the Spanish version “Escapar,” and then catch each album Telephone, Telefono or both! Lando Chill is back with his second release through Mello Music Group, The Boy Who Spoke to the Wind. Based on Paulo Coelhno’s The Alchemist, this powerfully poetic take on hip hop follows the Chicago rapper’s journey into the self and the evolution of sound from his previous work. With truly unique instrumentation, Lando Chill also extends his reach outward, covering social issues like police brutality and political freedom to artfully illustrate the perspective of the marginalized. The Boy Who Spoke to the Wind is intensely intimate, and each soothing and interesting track will leave you thinking. Get to know the man behind the music below before checking out the full album here.